Our experts can recover the lost data from all the types of Medias, Hard Drives Servers, External Hard Drives, Flash Memory, USB Memory Sticks, SD / CF Cards, SERVER RAIDs and Solid State Drives (SSD) and Network Attached Storages. Smart Data Technology is one of the World’s leading data backup and recovery specialists in the middle east. Our main aim is 100% safety and customer satisfaction .We can backup the data very seriously and, securely. We continually improve our service and technology. Private company or corporate companies lose valuable data because of viruses, hardware failure, theft or other issues. You can safe the data 100% Secure and guarantee with smart data technology. 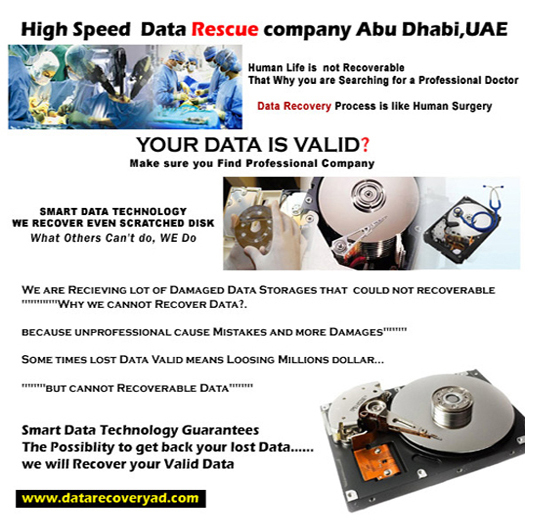 The only one scratched proof data safe and disaster recovery company in the middle east.